The blue light issue has several aspects. First one needs to separate between the tiny bright blue diods used on some electronic devices, the blue-white light from white LEDs, CFLs and xenon arc car headlight lamps, and the (more or less) warm-white light from incandescent-mimicking CFL and LED. This blog is primarily about replacement lamps for general illumination, not signal lights, monitor backlighting and the like, but the information on bright blue light may still be relevant for the cool-white light as well. 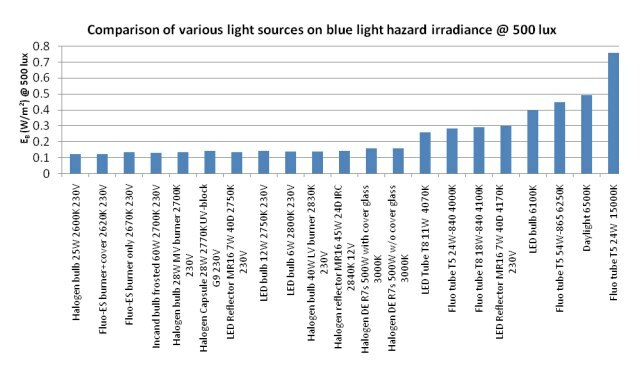 Blue hazard: There is a concern that blue LEDs and cool-white LEDs are now capable of exceeding safe limits of the so-called blue-light hazard as defined in eye safety specifications such as ANSI/IESNA RP-27.1–05: Recommended Practice for Photobiological Safety for Lamp and Lamp Systems. The Purkinje shift also noticeably brightens blue or green lights in our peripheral vision under medium to low light conditions, because there are comparatively more rods towards the edge of the retina – hence complaints that blue LEDs are distracting even when they’re not the focus of attention. “Glaring LEDs on displays that you need to see at night… that’s poor design,” says Brandon Eash. Remarkably though, it is a mistake that manufacturers continue to make. “It’s well recognized that blue light is not as sharply focused on the retina as the longer wavelengths. It tends to be focused in front of the retina, so it’s a little out of focus,” explains Dr. David Sliney, a US Army expert on the physiological effects of LEDs, lasers, and other bright light sources. For similar reasons, blue scatters more widely inside the eyeball, says Dr. Sliney, who answered questions by phone last year from his office at the US Army Center for Health Promotion and Preventive Medicine in Maryland. The modern human eye evolved to see fine detail primarily with green or red light. In fact, because we are poor at distinguishing sharp detail in blue, our eyes don’t really try. The most sensitive spot on the retina, the fovea centralis, has no blue light-detecting cones. That’s right: we’re all color blind in the most sensitive part of our eyes. In addition, the central area of the retina, the macula, actually filters out some blue light in an effort to sharpen our vision. Snipers and marksmen sometimes improve on nature by wearing yellow-tinted ‘shooters glasses’, which block the distracting blue light. Although our retinas simply don’t handle blue very well, nobody told the rest of the eye that. If blue is the strongest color available and we want to see fine detail, then we strain our eye muscles and squint trying to pull the blue into shaper focus. Try to do this for too long and you’ll probably develop a nauseating headache. This won’t happen in a normally lit scene, because the other colors provide the sharp detail we naturally desire. Intense blue light can cause long-term photochemical damage to the retina. Now, nobody is claiming that you’re likely to suffer this kind of injury from a normal blue LED (unless you stare fixedly at it from a few millimetres for an hour). However, it is theorized that this may be the evolutionary driving force behind the immediate feeling of pain we get from bright light with a very strong blue component. Our body’s instinctive reaction is to reduce blue light entering the eye by closing down the pupil. This means that blue light spoils night vision. After a brief flash of blue, you can’t see other colors so well for a while. When it comes to lamps for general illumination, the issue gets more complex. Cool-white or daylight-mimicking indoor illumination may not be as good for vision as previously assumed. But can it be harmful? In June, PLDA Greenpages blog reported on new studies that “have concluded that LEDs present no greater optical hazard than other common artificial lighting sources”. The link required business and registration to be accessed, but the abstract appears to be the same as in this March 2012 white paper of the Global Lighting Association on The Optical & Photobiological Effects of LED, CFLs and Other High Efficiency General Lighting Sources, which in turn appears to be fairly identical to the July 2011 position statement from CELMA and ELC (European luminare and lamp manufacturers, respectively): Optical safety of LED lighting. Commonly discussed hazards affecting the eye are blue light hazard (BLH) and age‐related macular degeneration (AMD) which can be induced or aggravated by high intensity blue light. Furthermore, UV (ultraviolet) may affect the eye, causing cataract or photokeratitis (sunburn of the cornea); IR (infrared) radiation can induce IR cataract (also known as glassblower’s cataract); and, radiation of all wavelengths can lead to retinal thermal injuries at extreme intensities. Optical radiation, particularly UV can be harmful to the skin. By far the most hazardous source to consider is the sun. Sunburns (UV erythema) and skin cancers due to long‐term exposure to the sun are well‐known problems caused by radiation. Moreover, patients with autoimmune diseases such as lupus or photodermatoses can be highly sensitive to UV radiation, and sometimes also blue light. There is concern among some patients who suffer from such sensitivities that phasing out of the known incandescent lamps will leave them without lamps for indoor use that are low in radiation of UV and blue light. Evaluation at a distance producing 500 Lux: Taking the 500 Lux criterion as the measurement basis, none of the LED products belongs to risk group 2. This was also confirmed by a study of the French agency for food, environmental and occupational health & safety (ANSES) in 2010 which found that even high‐output discrete LEDs are classified into risk groups 0 or 1 if the 500 Lux criterion is applied. The lens of a child’s eye filters blue light less efficiently than an adult’s lens. Children are thus more sensitive to blue light hazard. Therefore, at places frequented by children particular care must be taken to ensure that lamps and luminaires are chosen and installed in such a way as to avoid people looking directly into the light source. It is not necessary that LEDs (or blue light in general) are avoided in an environment with children present, for the reasons stated above. If used across a broad surface or area, in a way which does not produce glare, even “pure” blue light is completely harmless; regardless of whether it is the blue in daylight or produced by LEDs or other light sources. The above statements are valid for healthy people in the general public. People with highly sensitive skin or eyes for blue light may be wise to investigate alternative light sources that operate on a more specific radiation band not covered by the applied action curves that cover a broad range of radiations. The comparative data given in the annexes of this paper serve to give guidance in selecting the best available type of light source for a given sensitivity. It needs to be mentioned that blue light exposure is important to human beings. Blue light with a peak around 460‐480nm regulates the biological clock, alertness and metabolic processes. CELMA‐ELC has installed a special working group to translate these findings into practical application norms and standards. In natural conditions, outdoor daylight fulfils this function. Yet, people spend most of the day indoors (offices etc.) and are often lacking the necessary blue light exposure. Blue and cool white light sources can be used to create lighting conditions such that people will receive their daily portion of blue light to keep their physiology in tune with the natural day‐night rhythm. Due to the highly flexible application possibilities, LED based light sources are particularly well suited for that purpose. […] Case A can generally be considered safe. To give an example, looking at the scattered blue sky (high blue irradiance but low radiance) is completely safe, and so are artificial light sources, containing way less blue irradiance than daylight. […] Looking straight at a light source (case B) is also in general safe for diffuse and warm white light sources, like frosted or white diffusing lamps. Yet, caution is advisable for cool white or blue, bright (high intensity), point‐like light source, for instance an incandescent filament, electric arc or an LED die, even an LED die behind the lens of a directional lamp. Such point‐like sources are projected on the retina as a concentrated light spot and can damage that spot on the retina when the intensity is high enough and the spectrum contains blue light in congruence with the blue light hazard action spectrum curve. LED based light sources do not emit any UV radiation (unless specifically designed for that particular purpose). Therefore, they are not harmful to people with a specific sensitivity for certain UV radiation and can bring relief to certain groups of patients. In this respect, LED based light sources provide advantages over traditional incandescent, halogen and Compact Fluorescent lamps. For more details see Annex 2. In contrast to most other light sources, e.g. halogen and incandescent lamps, LEDs hardly emit IR light (unless specifically designed to emit a certain type of IR). For available types of indoor light sources the IR radiation is not powerful enough to pose any risks to human. To summarize the key findings, LED sources (lamps or systems) and luminaires are safe to the consumer when used as intended. Which is: Don’t sit too close to a UV-emitting light source. Don’t look straight into cool-white or bright light sources (risk increases with proximity, brightness and time). Always use low-voltage halogen mini bulbs and halogen mini tubes on luminaires with glass cover (regular glass filters out the UVC which the quartz glass lets through). Use warm-white LED, CFL or halogen in frosted outer bulb if UV-sensitive. In terms of their level of photo biological safety, LED lamps are no different from traditional technologies such as incandescent lamps and fluorescent tubes. The portion of blue in LED is not different from the portion of blue in lamps using other technologies at the same colour temperature. White LEDs typically show a peak in the blue (at around 450 nm when a royal blue LED is used) and more broadband emission in the green/yellow part of the spectrum. Next to the blue peak, a dip is visible at around 490nm that also falls under the BLH action curve (…). The blue peak of the LED lamps is “compensated” by the dip, therefore the total blue output (…) of LED of 2700K is comparable to an incandescent lamp of 2700K. This still does not make the spectrum exactly the same, even if the net result is a similar blueness. And most LEDs available on the home market is very much bluer than the 2700 K of the very best (and most unaffordable) warm-white LEDs. Nevertheless, looking straight into bright, point‐like sources (LEDs, but also other strong point‐like light sources, like clear filament or discharge lamps and including the sun) should be prevented. However, when people happen to look into a bright light source accidentally, a natural protective reflex occurs (people instinctively close their eyes or look away from the source). A comparison of LED retrofit products to the traditional products they are intended to replace reveals that the risk levels are very similar and well within the uncritical range. But that was for the 6 watt warm-white LED in a frosted outer bulb included in the comparison. White 4000 K LEDs and directional high power LEDs, as well as other bright point light sources, including clear tungsten filament lamps, fall into risk group 1. In general, the probability is low that artificial lighting for visibility purposes induces acute pathologic conditions, since expected exposure levels are much lower than those at which effects normally occur, and are also much lower than typical daylight exposures. Certain lamp types (quartz halogen lamps, single- and double-capped fluorescent lamps as well as incandescent light bulbs) may emit UV radiation, although at low levels. However, according to a worst case scenario the highest measured UV emissions from lamps used typically in offices and schools [usually fluorescent tubes] could add to the number of squamous cell carcinomas in the EU population. Household lighting involves an illumination level which is so low that exposure to potentially problematic radiation is considered negligible. There is no consistent evidence that long-term exposure to sunlight (specifically the blue component) may contribute to age-related macular degeneration (AMD). Whether exposure from artificial light could have effects related to AMD is uncertain. No evidence was found indicating that blue light from artificial lighting belonging to Risk Group 0 (“exempt from risk”) would have any impact on the retina graver than that of sunlight. Blue light from improperly used lamps belonging to Risk Groups 1, 2, or 3 could, in principle, induce photochemical retinal damage in certain circumstances. There is however no evidence about the extent to which this is actually occurring in practical situations. There is mounting evidence suggesting that ill-timed exposure to light (light-at-night) may be associated with an increased risk of breast cancer, and can also cause sleep disorders, gastrointestinal, and cardiovascular disorders, and possibly affective states. Importantly, these effects are directly or indirectly due to light itself, without any specific correlation to a given lighting technology. But bluer light (such as from cool-white or daylight LEDs and CFLs) has a greater effect on melatonin, even at very low intensities if used at night (see Circadian Rhythms below). The SCENIHR opinion on Light Sensitivity identified that some pre-existing conditions (epilepsy, migraine, retinal diseases, chronic actinic dermatitis, and solar urticaria) could be exacerbated by flicker and/or UV/blue light. At that time there was no reliable evidence to suggest that compact fluorescent lamps (CFLs) could be a significant contributor. More recent studies indicate a negative role for certain CFLs and other artificial light sources (sometimes including incandescent bulbs) in photosensitive disease activity. UV, and in some patients, visible light can induce skin lesions of true photodermatoses. Although sunlight is reported by most patients as the main source of disease activity, artificial lighting is reported to play a role in some cases. The blue or UV components of light tend to be more effective than red components in aggravating skin disease symptoms related to pre-existing conditions such as lupus erythematosus, chronic actinic dermatitis and solar urticaria. UV and/or blue light could also possibly aggravate the systemic form of lupus erythematosus. It is recommended that all patients with retinal dystrophy should be protected from light by wearing special protective eyeware that filters the shorter and intermediate wavelengths. 5. IR-hazard for the eye (sections 3.4.3.1 and 3.4.3.2). According to the standards, measurements should be performed according to two approaches; viz. at a distance where a light intensity of 500 lx is obtained and also at a distance of 20 cm (…). Based on these measurements, lamps are then classified according to the “Risk Group” (RG) to which they belong. RG0 (exempt from risk) and RG1 (minor risk) lamps do not pose any hazards during normal circumstances. RG2 (medium risk) lamps also do not pose hazards because of our aversion responses to very bright light sources, or due to the fact that we would experience thermal discomfort. RG3 (high risk) include only lamps where a short-term exposure poses a hazard. This classification is based on acute exposure responses (a single day, up to 8 hours) and applies only to individuals of normal sensitivity. The contribution from the European Lamp Companies Federation (ELC) included six lamp types from eight manufacturers, considered by ELC to be “representative lamp types”. Discomfort glare does not impair visibility but causes an uncomfortable sensation that causes the observer to look away from the glaring source. It increases when the light source is facing the observer. Disability glare is due to the light scattering within the ocular media which creates a veil that lowers any contrast and renders viewing impossible. The luminance of the sky is rather stable at about 5,000 cd/m2. This value can be exceeded on bright surfaces on clear days when luminance can reach several tens of thousands cd/m2. The sun is never viewed directly except when it is at sunrise or at sunset when its luminance is about the same as the sky and its colour temperature low or moderate. It is when both the luminance and the colour temperature of the light are high that the blue light hazard increases. The results presented in the ELC report suggest to SCENIHR that there is little or no risk to individuals of normal sensitivity from the UV, IR or blue light optical radiation emission from lamps which are considered to be “representative” of the type of lamps selected to replace incandescent lamps. SCENIHR however considers that “non-representative” lamps may emit levels that are much higher than those included in the report; however quality control limits applied by lamp manufacturers were not reported. Further consideration should also be given to the “intended” vs. “reasonable foreseeable” use of lamps. Further consideration also needs to be given to the risk classification of high power LEDs. Also, halogen lamps that are intended to be used with an external glass filter must not be used without the filter because of the risk of exposure to UV radiation. Recent studies indicate that ill-timed exposures to even low levels of light in house-hold settings may be sufficient for circadian disruptions in humans. A comparison between the effects of living room light (less than 200 lx) and dim light (<3 lx) before bedtime showed that exposure to room light suppressed melatonin levels and shortened the duration of melatonin production in healthy volunteers (18-30 years) (Gooley et al. 2011). Cajochen et al. (2011) compared the effects of a white LED-backlit screen with more than twice the level of blue light (462 nm) emission to a non-LED screen on male volunteers. Exposure to the LED-screen significantly lowered evening melatonin levels and suppressed sleepiness. In another study from the same group (Chellappa et al. 2011) 16 healthy male volunteers were exposed to cold white CFLs (40 lx at 6,500 K) and incandescent lamps (40 lx at 3,000 K) for two hours in the evening. The melatonin suppression was significantly greater after exposure to the 6,500 K light, suggesting that our circadian system is especially sensitive to blue light even at low light levels (40 lx). However, no study has investigated whether the impact of warm white CFLs and LEDs (2,700-3,000 K) on melatonin suppression is in any way different from that of incandescent lamps. There is a moderate overall weight of evidence that ill-timed exposure to light (light-at-night), possibly through circadian disruption, may increase the risk of breast cancer. There is furthermore moderate overall weight of evidence that exposure to light-at-night, possibly through circadian disruption, is associated with sleep disorders, gastrointestinal and cardiovascular disorders, and with affective disorders. The overall evidence for other diseases is weak due to the lack of epidemiological studies. It seems that bright white light in the daytime can be helpful in keeping one alert for work (though preferably the real thing rather than a daylight-mimicking copy). But at night – very bad idea! Unless you’re doing shift work and really need to stay awake. I have started noticing the effect of bright white light at night. My macbook has a LED screen and the cool-white background on most pages tends to be a very bright. Great in the daytime, not so great at night… So I’ve installed the f.lux app that adjusts the screen light temperature to follow the sunset at one’s particular location, and a similar app for my OLED screen Android. I also try and make sure to get enough real daylight in the daytime and then I dim indoor lights more and more as the evening progresses. With these simple measures, my very easily disrupted circadian rhythm has gotten markedly more normal, almost miraculously so. The French Agency for Food, Environmental and Occupational Health Safety have issued official warnings about selling white LED lamps to the general public due to the toxic effect of blue light. The principal characteristic of diodes sold for lighting purposes is the high proportion of blue in the white light emitted and their very high luminance (“brightness”). The issues of most concern identified by the Agency concern the eye due to the toxic effect of blue light and the risk of glare. These new lighting systems can produce “intensities of light” up to 1000 times higher than traditional lighting systems, thus creating a risk of glare. The strongly directed light they produce, as well as the quality of the light emitted, can also cause visual discomfort. Blue pollution: Because cool-white LEDs with high color temperature emit proportionally more blue light than conventional outdoor light sources such as high-pressure sodium vapor lamps, the strong wavelength dependence of Rayleigh scattering means that cool-white LEDs can cause more light pollution than other light sources. The International Dark-Sky Association discourages using white light sources with correlated color temperature above 3,000 K.
So, no cool-white LED or metal halide streetlights please!